An Old World native, like S. alba established in moist ground as on shores and banks. First collected in 1892 in St. Clair Co. The leaves or bracts on the short flowering branchlets of this species and S. alba are usually ± entire; glands are generally conspicuous at the summit of the petiole on mature leaves, but usually not on younger ones. The branchlets of S. euxina are very brittle (whence the name) at the base, breaking off in windstorms. Twigs broken in this way may root at the edges of rivers and streams. Belyaeva (2009) has shown that the hybrid formerly known as Salix ×rubens should be called S. ×fragilis, L., and the species long known under this latter name must now be called S. euxina. See also the discussion under S. alba. Collections from a very large shrub along the Thunder Bay River in Alpena Co. (R. Garlitz 2305a, b) are S. triandra L. × S. alba or S. euxina. 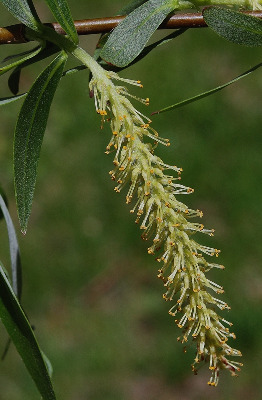 Salix triandra has glabrous leaves, like S. euxina, but with long-persistent stipules and 3 stamens in the male flowers. Salix euxina lacks persistent stipules and has only 2 stamens. MICHIGAN FLORA ONLINE. A. A. Reznicek, E. G. Voss, & B. S. Walters. February 2011. University of Michigan. Web. April 20, 2019. https://michiganflora.net/species.aspx?id=2628.